Chicago is not lacking for big tasting events, but perhaps no festival has exploded over the last few years as much as The Chicago Independent Spirits Expo, returning for its fourth year. The 2014 incarnation will feature over 120 exhibitors offering more than 500 different spirits and will be held next Tuesday, September 30 at the downtown Chicago Hilton Hotel. Tickets for the event are still available. Regular admission buys you 2 1/2 hours (6:30-9:00 pm) to walk around and sample, while the VIP pass allows you early entrance, extending your stay for a full 4 hours (5:00 – 9:00 pm). Offerings range from Chicago’s favorite local upstarts–including Letherbee, North Shore, Koval, FEW and Chicago Distilling Company–to imports from around the world–such as Compass Box Scotch, Kavalan Whiskey, Chartreuse liqueur, Del Maguey Mezcal and Kappa Pisco. And, for the geekiest among you, the event also includes two roundtable discussions earlier in the day–the first on the state of the industry and the second on women of the spirits world. Both will bring together distillers, distributors, bar owners and media to give an inside look to the joys and challenges of the business. The event is partnering this year with UN86’d, a charity which helps restaurant and bar professionals in the area of heath benefits and medical costs. A portion of each ticket sale will be donated to the group. 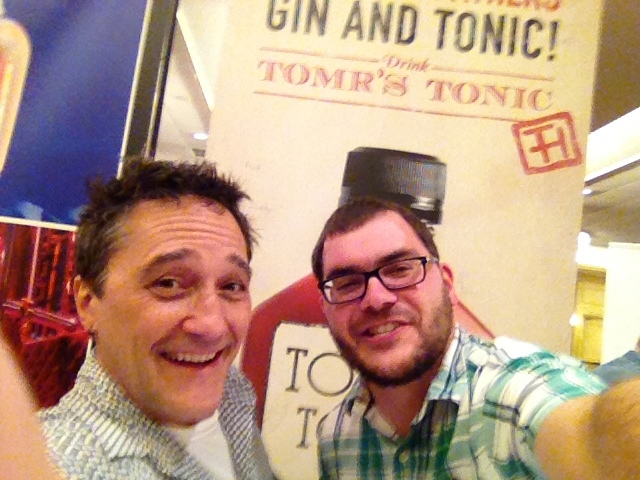 The author posing with Tom of Tomr’s Tonic at last year’s Spirits Expo. Chicago Foodies will be there and we want to help get you there, too! When you order your tickets, use the discount code INDIECITY to get $20 off either the regular or VIP admission. Woot! And that’s not all! We have a pair of VIP tickets to give away to one of our loyal readers. To enter, tell us what spirit or company you most want to taste and why. We’ll pick among all the entries from now until Saturday at 6:00 pm. Comment on this post, tell us on Facebook, or tweet us @ChicagoFoodies. For the most up-to-date details on the event and for more information on who will be sampling, check out the Independent Spirits Facebook page.